In the 100 year period that began in 1830, the steam locomotive was the prime industrial force that shaped our landscape. The railroad's impact on American music has been of equal significance, providing themes, metphors, and images that richly invest song after song with color and meaning. In the African-American tradition, the rhythms of the railroad - the chug chug of the steam engine, the clickety-clack of rolling wheels, the scream of the whistles and the screech of the brakes - are recreated time after time in blues, jazz, boogie woogie, R & B, gospel, and soul music. 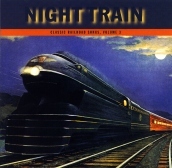 Night Train, compiled by Michael Hyatt and annotated by Norm Cohen, proudly presents some of the best railroad songs recorded by African-Americans since 1929.